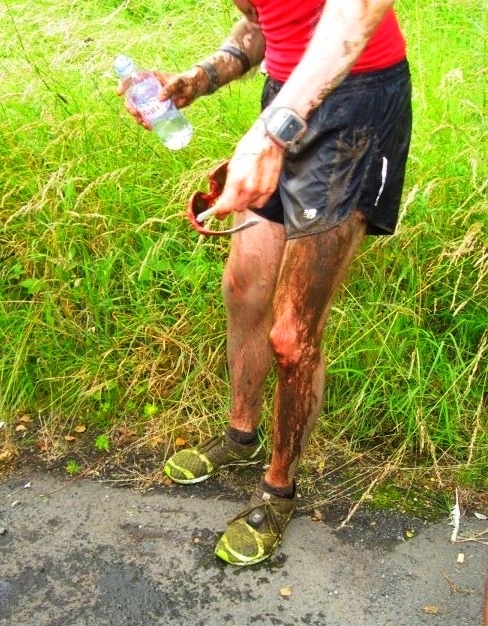 First up was a Bob Graham Round attempt on the 6th July, 2 weeks after the race. So, no real time for resting, training or tapering. My fault – I knew it was tight but really wanted to try as I had the opportunity to do it with a friend and some other fantastic runners and support. For anyone not familiar with a BGR it’s pretty straightforward: you have 42 Lake District peaks to top in 24 hrs. You set out from Keswick and tackle each of the fells in a specific order, ensuring you return to Keswick not a minute over the 24hrs – doing so is classed as a success. There’s no race, no fanfare just a daunting 26,000ft of ascent along 66 miles of Lakeland terrain (amongst other things). One of those being the weather. Turns out the 6th was one of the worst days I remember from any summer. We had planned a 6pm start and looking back, the signs were all there – it was wet, it was windy and looked ominous. When we hit the first exposed part of Skiddaw the wind let us know just how insignificant we were. At one point I was actually blown over and considered picking up some boulders for my pack. A few hours later internally things weren’t right for me. I couldn’t tap the normal reserves of energy in my legs and it went downhill from there. As I pushed hard to keep up with the other guys my head was getting sore and my eyes started to blur until I was struggling to see properly through the dazzling zigzag lines that were creeping in from the edges of my eyes. I’ve had the feeling in the past when I was a teenager, and a migraine normally followed afterwards. This was the first time it had happened through running. Maybe just low blood-sugar or something? By this time I was also getting cold. Soaked through, the wind and rain persisted and I tried not to shiver but it took over for a while. The guys went on and I stopped to try to shake it off. Mark (one of the support runners) stayed with me to see I was going to be ok. As we finally started the descent to Threlkeld we took the wrong line and ended up on a long and treacherous exit. Before the bottom it was dark and my headtorch was in the carpark. All in all, a disaster, but hugely grateful to all the support. The other guys battled on, one doing the sensible thing and pulling the parachute near the end of leg 2. The others made it all the way to round to Wasdale but by that time were broken, and way off schedule. Next time guys. After that I thought I’d try the Clydestride Ultra. 40+ miles from Glasgow to New Lanark – mostly on paths and with no real hills / obstacles. To cut a long story short, race was going pretty well until I got lost for the first time. Nettles and barbed wire fences followed and I lost a place or 2. Back on track (in my road shoes) I hit a large muddy patch at speed and went down heavily. 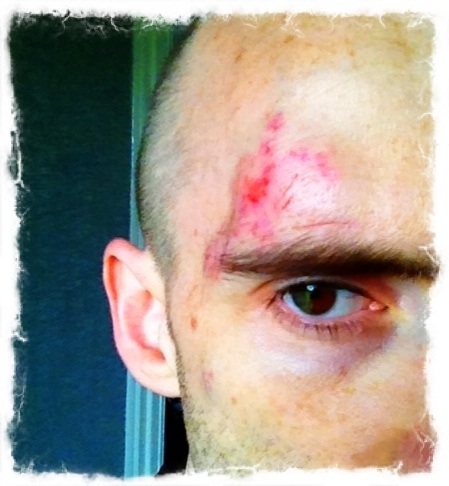 I landed on my knee and hip and cracked my head on something hard underneath the puddle. All went wrong from there. As well as being completely covered in mud, I could feel a swelling above my eye and I got lost again having at least attempted to follow the signs (unlike some of the other runners). When I got back on track, I passed some of the runners who had taken some places off me when I was wandering around trying to find the route. I then took what was obviously another wrong turn in full view of them and they didn’t even shout me back – something I’ve never experienced at an ultra race before. When I reached the next checkpoint I was obviously a bit of a sight – amusing to most it appeared. I cleaned up a little and people were really helpful with water and wipes (thanks). The next 10 mile section was one of the worst I’ve ever had. The swelling in my eye got worse and I started to feel confused / concussed. I walked, I stopped, I tried to run. People passed me, I wasn’t sure how far I’d gone, I’m sure I was passed twice by people I’d already seen. By the next CP I was generally seeing from one eye as it seemed easier to focus than using both. I wasn’t thinking straight at all. I thought I’d be fine to get to the finish but the crew said ‘no’. I fought with them about it as I wanted to finish anyway. Davie (my running Da) said it wasn’t fair to do it to my support as they’d be too worried about something happening. I couldn’t really argue with that as I had been getting progressively worse for the last 90 mins. So that was it. Another disaster! So, that was another 2012 #fail. Another bit of character building I guess, and another thing to try to put behind me. I thought about doing the Devil of the Highlands race a few weeks after that but decided it wasn’t worth the risk and I’d train instead for the biggest race of my life so far. No better place to try to scrape some success out of 2012 than at the Ultra Trail du Mont Blanc event in Chamonix where I’m running the TDS race. I’m going out with a great bunch (all competing) so really looking forward to it. See Marko’s great post if you want to know more. Less than 2 weeks to go now. Heading out on Saturday morning. Excited? yes! Nervous / worried? Absolutely. Looks pretty exciting though, eh? This entry was posted on August 19, 2012 by pyllon. It was filed under 2012, Bob Graham Round, Clydestride, Endurance, Hill running, Lake District, Offroad, Race, TDS, UTMB and was tagged with BGR, Clydestride, fell running, hills, TDS, UTMB. with out risk and failure there is no reward for success !! Good luck Paul, Chamonix will be great. First time I’ve not been there for several years, but once experienced I’m sure you’ll want to go back. Start slow, there’s a lot of uphill! Runners not shouting when you go off course? Is this the a sign of what’s to come now that ultra running is becoming far more of a mass participation sport? It’s like the amount of litter now being dropped on some of the higher profile races, which is shameful. Now that a lot of trail ultra runners are coming from road running rather than fell running/walking is the culture going to head that way. I sincerely hope not or the pleasure of it will fast diminish. I think there is a real risk. Was really surprised at how much litter I saw even at UTMB (when there weren’t too many ahead of me). I guess the more popular it gets the worse it might be. Whilst I’m as competitive as the next person, I certainly wouldn’t let someone go off-course if I knew the way myself. Like you say, people are now coming from very different backgrounds so you can only hope it’s just a ‘bedding-in’ period! Maybe I’ll be a little more fussy about race choices going forward.